I cannot tell you how much I love your blog!! 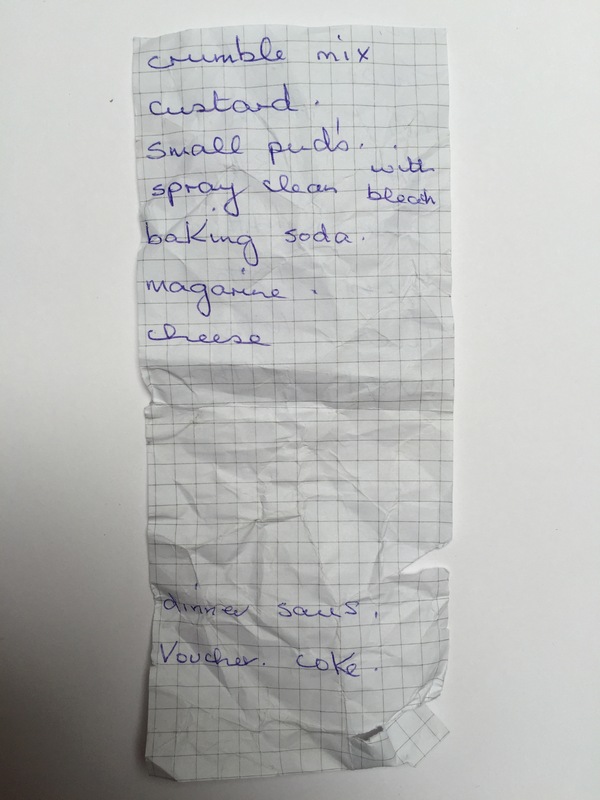 I’ve been fascinated by shopping lists for years! Such a fascinating glimpse into other lives and personalities. Aw, thanks! Maybe there is a coffee table book in the making. You would get a big credit. If you have a list of your own that you would like to let me have, I would be very happy to post it. It is so easy to make your own crumble – mixed fat with flour add sugar plonk it on top of cooked fruit – This person has not much energy for cooking and is more obsessed with keeping the kitchen clean – might be a working mum – she is looking for something ready made for the kids dinner – if not there is always sausages, and she is wondering whether to use the voucher for cola.